Oh wow, where did January go? 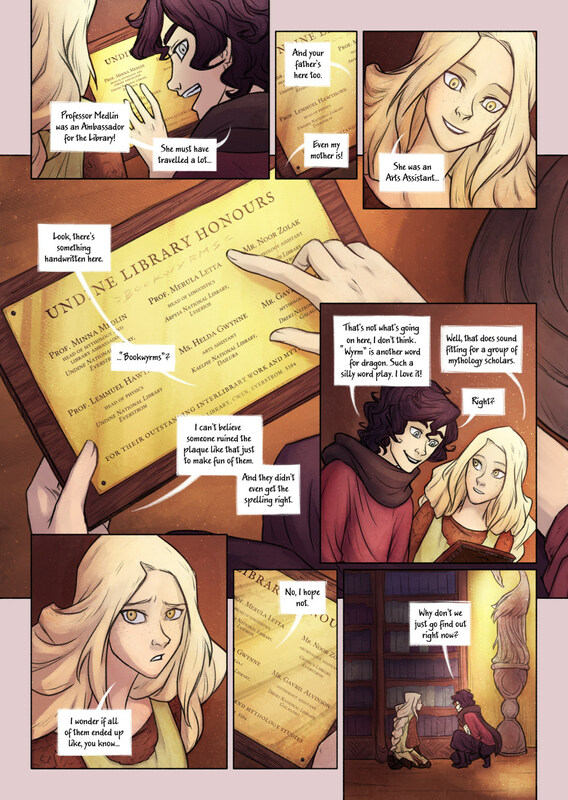 I had something I wanted to talk about in the description but I can’t seem to rememb- oh wait, yes: BOOKWYRMS. Now you know where the name of this comic comes from. And we are only at page 104! I actually had my doubts that this point would be too far into the story to explain the title, but I finally thought because the main characters are all quite bookish and there are some mythology elements, readers would probably accept/don’t mind the title until they got here. I’m also very happy to introduce all these new places (and names of ancients gods/goddesses): The Arpyia, Dreki, Griphus and Kaelpie libraries, set across the different countries depicted in the map. “The end”. That was all, folks! Bibliophile club sounds awesome, by the way! *when you realize you also read this on wtooand that you are ahead here. * whoops. But still. Who knew her mother would have history in the library? And as an arts assistant too. I wonder if the mother maybe knew the person who..made their unfortunate deaths happen. Still really glad she was apart of the library at one point. It brings more drama and wonder and amazement! I also wonder if Sherard is somehow related to Suzanne. The hair is the same but that could just be anyone’s hair color. Only the author knows….. It feels like someone should play the clip of Sherlock saying “the game is on”. That would’ve been so awesome!